HOUSTON, April 3, 2013 /Christian Newswire/ — Revival came from Azusa Street, Los Angeles, California, to Tranquility Park, Houston, Texas, and the surrounding area through the combined ministries of Glenda Jackson and Verna Linzey with prophecy, preaching, teaching, and the laying on of hands. Others who ministered in support of their ministries were Eric Maksym, Shawn Morris, David Summerlin and Jim Linzey. Revival broke out. The revivals here and at Azusa Street and Bonnie Brae Street recently led by Verna Linzey come 100 years after Charles Parham and William Seymour prophesied that another revival in Houston and in Los Angeles would erupt. Manifestations abounded, including salvations, baptisms in the Spirit as confirmed by speaking in tongues, slayings in the spirit, prophecies, impartation services, healings, quaking, shaking, wailing, screaming in the Spirit, uncontrollable laughing in the Spirit, preaching and teaching. The racial makeup of those who flocked to the meetings were African American, Asian, Hispanic, Native American and Caucasian. Prophetic utterances indicated this revival was going around the world. 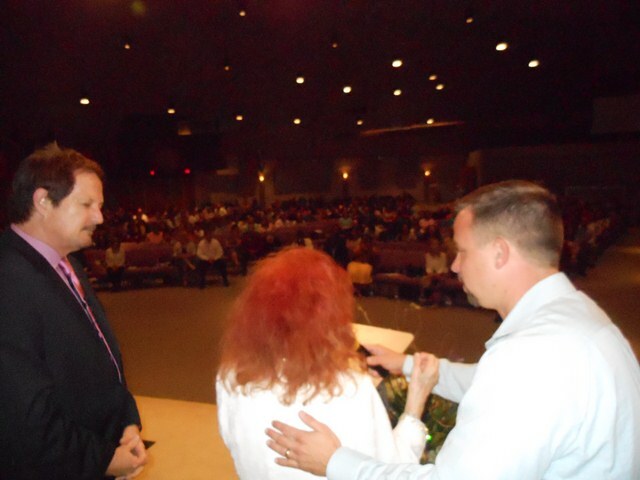 This has already been confirmed when those from around the world and the nation came and sat under the ministries of Verna Linzey and Glenda Jackson, and have been impacted, and went taking the message of the baptism with the Holy Spirit with them. Revival erupted Wednesday night, March 27, the night before meetings were scheduled to commence. At the River Church, David Summerlin met with leadership and laity of his church to “talk” about the forthcoming meetings. But something happened. Verna Linzey showed up. She was not intending to, but insisted that her son take her. The power of God hit like lightening and some broke out in ecstatic utterances. Others began to weep. Some got on their knees as Verna laid hands on them. Some asked for prayer for healing or for other things. They lined up. When the “meetings” began the gates of hell shook. Terror struck demons. Glenda Jackson and Verna Linzey spoke the word of God, and God empowered hundreds throughout the week with fresh anointings and baptisms in the Spirit with the speaking with other tongues as the Holy Spirit gave them utterance. Revival is here.